LANSING — If you’re a Michigander who likes expensive races for Congress, 2018 may be the year for you. According to new fundraising disclosures that were due on Sunday, campaigns for Michigan’s 14 seats in the U.S. House had already drawn $30 million as of June 30, 2018. That’s more than Michigan’s U.S. House races had attracted at the same point before the 2014 and 2016 elections. As of mid-July 2014, the 2014 candidates had combined to raise only $26 million, according to the Michigan Campaign Finance Network’s tracking for the primary. The new fundraising disclosures for 2018 only cover through the end of June. 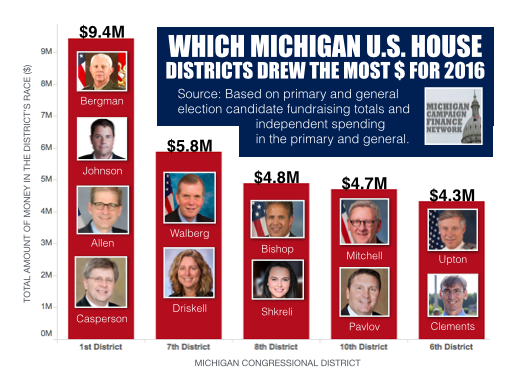 At the same point before the 2016 election, Michigan candidates for the U.S. House had raised about $21 million. Through the end of the November campaigns, the 2016 races for the U.S. House brought a total price tag of about $40 million, which includes candidate fundraising and independent spending by interest groups. There hasn’t been heavy independent spending yet in the 2018 races. And with four months until the November election, the 2018 races appear to be on pace to easily surpass the $40-million total. 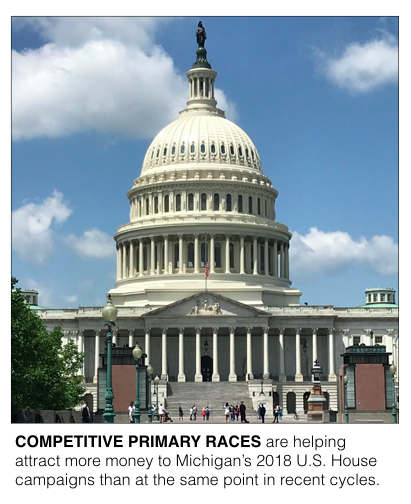 The fundraising numbers are moving upward in part because there are a handful of crowded primary races for the U.S. House this summer in Michigan but also because there are more candidates raising larger amounts. In 2016, only six candidates had raised more than $1 million as of the end of June. For 2018, 10 candidates have already raised more than $1 million. The 2018 races feature a six-person primary for the Democratic nomination in the 13th Congressional District, a five-person primary for the Democratic nomination in the 11th District, a five-person primary for the Republican nomination in the 11th District, a three-person primary for the Democratic nomination in the 9th District and a four-person primary for the Democratic nomination in the 6th District. The 13th District seat is open after former Rep. John Conyers, a Democrat from Detroit, resigned. The 9th District and 11th District are open because Reps. Sandy Levin, a Democrat from Royal Oak, and David Trott, a Republican from Birmingham, decided not to seek re-election. In the 6th District, multiple Democrats want to challenge long-time incumbent Rep. Fred Upton, a Republican from St. Joseph. To see a breakdown of all of the new fundraising numbers and the top donors to each of the U.S. House candidates, click on this link. The following is a listing of the districts drawing the most money so far in 2018. With crowded primaries on both sides, numerous candidates are raising lots of money in the open 11th District. On the GOP side, businesswoman Lena Epstein has brought in the most money at $1.6 million. Of that, $990,000 came from her own pocket. But state Rep. Klint Kesto raised the most over the last three months: $166,440. On the Democratic side, two candidates have already raised more than $1 million. Businessman Suneel Gupta has raised $1.3 million, and Haley Stevens has raised $1.0 million. Stevens was chief of staff to former President Barack Obama’s Auto Task Force. State Rep. Tim Greimel is closing in on a $1 million, raising $815,322 so far. And Fayrouz Saad, who also served in the Obama administration, has raised $636,043. All four of those Democrats have been airing broadcast TV ads. All of this money is flowing into the 11th after the 2016 race in the district cost only about $2.5 million total. Unlike the 11th, the 8th District was somewhat of a battleground in 2016. That cycle, the district attracted about $4.8 million in campaign money. It’s only the beginning of July and already the 2018 race has surpassed the 2016 total. That’s mainly because of the fundraising success of Democrat Elissa Slotkin. Slotkin, who previously worked in the Defense Department, has raised more money than any other U.S. House candidate in Michigan, including all of the incumbents, at $2.8 million, according to disclosures. Slotkin faces professor Chris Smith in the Democratic primary. Smith has raised $123,257 so far for his campaign. Rep. Mike Bishop, a Republican from Rochester, who wants to keep his seat, has raised $2.1 million for his campaign since his last election. 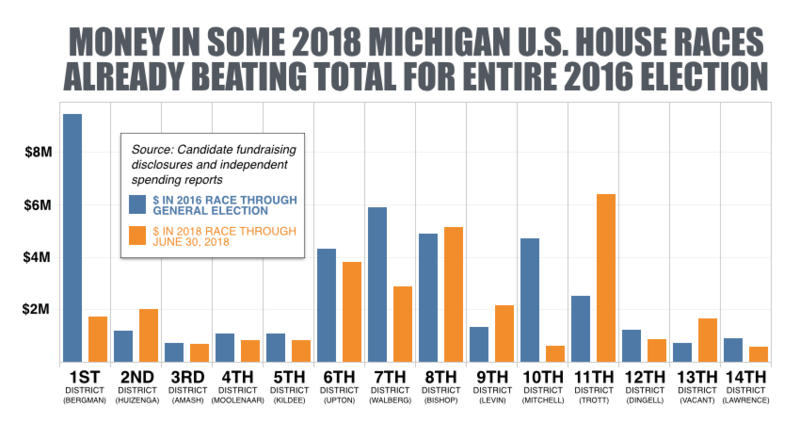 The only significant amount of disclosed independent spending in the Michigan U.S. House races so far has come in the 8th District, race where the group End Citizens United has reported spending $50,000 in favor of Slotkin. Upton has already raised $2.2 million for his re-election campaign. The four Democrats hoping to unseat him have combined to raise $1.5 million. The top Democratic fundraisers have been former Kellogg lobbyist George Franklin, who’s raised $700,609, and physician Matt Longjohn, who’s raised $625,492. The 7th District could see a rematch from 2016 as Rep. Tim Walberg, a Republican from Tipton, and former state Rep. Gretchen Driskell, a Democrat, have been the top fundraisers in the district so far. Walberg’s campaign has raised $1.5 million. Driskell’s campaign has raised $1.2 million. But Driskell’s campaign raised more over the last three months at $408,202 to Walberg’s $304,627. Both campaigns are behind where they were at the same point in 2016. Another Democrat, Steven Friday, is also in the race. He’s raised $41,881. Four candidates are in the running to replace Sandy Levin in Congress. Former state Rep. Ellen Lipton has the fundraising lead at this point, having raised $1.0 million. About $299,767 of that has come from Lipton herself. Sandy Levin’s son, Andy Levin, has raised $864,025. Another Democrat, Martin Brook, has raised $32,059. The Republican, Candius Stearns, has raised $199,216.